Susan Collins speaks to members of the media as she arrives for a luncheon with fellow Republicans on Capitol Hill on July 11. Senate Republican leaders originally blocked all five GOP women out of negotiations for their health-care bill. And on Tuesday, three Republican women sunk leaders' last-ditch effort to do something toward their promise to repeal and replace Obamacare. After Senate Republicans' second version of a health-care bill collapsed Monday under the weight of more than a dozen senators (male and female) who had concerns, Senate Majority Leader Mitch McConnell (R., Ky.) decided to just vote on repealing Obamacare without a replacement. McConnell's aim was to stick it to conservative senators who played an outsized role in sinking the first two versions of the bill. He was daring them to pull the trigger on something that could leave 32 million more people uninsured over the next decade and blow up the insurance markets. But before McConnell could even play chicken with these (mostly male) senators, by lunchtime Monday, Sens. Shelley Moore Capito (W.Va.), Susan Collins (Maine), and Lisa Murkowski (Alaska) shut that down. "I did not come to Washington to hurt people," Capito tweeted. 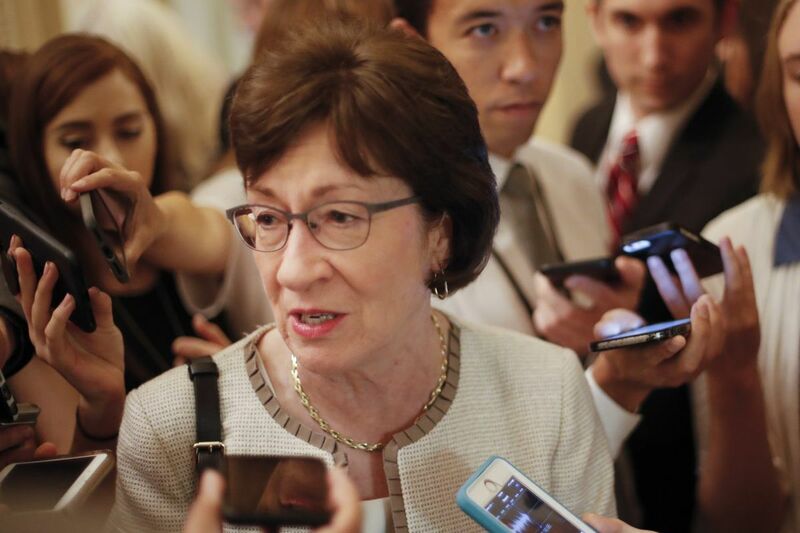 "I do not think that it's constructive to repeal a law that is so interwoven within our health-care system without having a replacement plan in place," Collins said in a statement. "I cannot vote to proceed to repeal [Obamacare] without reform that allows people the choice they want, the affordability they need, and the quality of care they deserve," Murkowski said. In the Senate's incremental world, three "no" votes is enough to stop a bill from even getting a chance for a full vote. By lunchtime Monday, Republicans' efforts to unwind Obamacare were dead, less than 12 hours after it had already died. And it was Senate Republican women who killed it. Let's rewind to explain why the Senate's five Republican women weren't originally involved in crafting a health-care bill. Republican leaders have been trying to write a bill that could pass an ideologically divided Senate since May, when House Republicans barely passed a controversial — and largely unpopular — piece of legislation. Senate leadership promptly threw that in the trash. Instead, Republicans set up a group of about a dozen lawmakers to come up with something more moderate. None of them were women. Republican aides stressed that the group was soon opened to any GOP senator who wanted to participate. Leaving women out of the negotiations for legislation that affects half the population in a very intimate way was a huge optics blunder for Republicans. It underscored the party's lack of diversity, especially in the Senate, where 47 out of 52 Republicans are men. Just last year, Collins had told researchers for a report about women in Congress that as a woman in this nearly all-white-male world, she has to fight harder to get recognized. "My experience has been, and sadly I think this is still true today, that when a woman is elected to the Senate, she still has to prove that she belongs there, whereas when a man is elected to the Senate, it's assumed that he belongs here," she said. But leaving out women soon turned into a political problem for Republican leaders, too. McConnell retreated behind closed doors to write the legislation, and soon, even the members of the original working group didn't know what was in the legislation. They unveiled a bill in June that received immediate skepticism from about a dozen senators, including Collins, Murkowski, and Capito. Republican leaders felt they had no choice but to negotiate the bill in secret to try to find a delicate balance between the party's conservative and moderate factions, which have very different ideas about government's role in health care. But in leaving senators out, they also left out their opinions. In the end, it was three female senators who were left out of negotiations from the start that torpedoed Republicans' final attempt to undo Obamacare. "Limbaugh on Collins, Murkowski, Capito: "Three female leftists" are now running the Senate. "- Daniel Dale (@ddale8) July 19, 2017"
Female Republicans' concerns were much the same as their male colleagues' concerns about the legislation. It would have cut Medicaid too much, raised premiums on the elderly and sick, and left rural hospitals without a safety net. Murkowski and Collins said they wouldn't vote for a bill that defunded women's health-care clinic Planned Parenthood. "This bill would make sweeping and deep cuts in the Medicaid program, which has been a safety net program on the books for more than 50 years," Collins told ABC News on Sunday. If there's a lesson in all this, it's that when trying to overhaul a major social program, perspectives matter.